Live commentary on Radio 5 live sports extra, BBC Radio Ulster, BBC Radio Wales, BBC Radio Cymru & BBC Sport website and BBC Sport app, plus live text commentary. Winning the Six Nations for three years in a row would be an incredible achievement for Ireland - they would be rewriting the record books. Lawrence Dallaglio has predicted that Ireland will finish fourth, which is baffling as they have won it for the last two years. If they can stay injury free, the Irish will be in with a shout. There will not be any hangover from the World Cup. Joe Schmidt will want to move on. 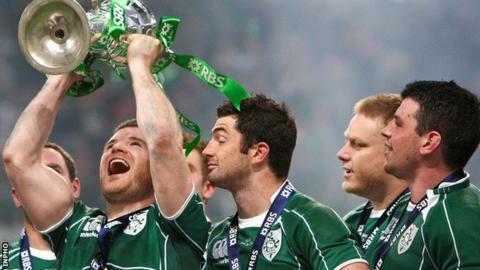 It is all about the Six Nations now and winning the championship. You definitely cannot write off Ireland. It is all about winning your first match and gaining momentum. I remember Ireland's first match in 2012 was against Wales. I was given a controversial yellow card and Leigh Halfpenny won the match with the penalty. We should have won that match, but it was Wales who went on to complete the Grand Slam. If you start with a win, you can build on that. But lose, and people start to question the coach, the captain, the performance - and the pressure just builds. I expect Joe Schmidt to start with Johnny Sexton, although Ulster's Paddy Jackson is, in my view, the fly-half in the best form at the moment. Johnny puts a lot of pressure on himself, but his big-game mentality is important. He has not had much game time for Leinster recently and the fact he got another head injury is a concern as well. I hope to see Ulster's Stuart McCloskey getting involved in the championship. If you look at his stats he is perhaps the best centre in Europe. Most carries, line breaks and turnovers. So why shouldn't he be playing? I would definitely have CJ Stander in the pack for his first Ireland cap. He is an outstanding back row and has been single-handedly winning games for Munster. It is great to see Rory Best being appointed captain and I don't see why it should have any negative bearing on his own form. There are plenty of experienced heads around him, such as Jamie Heaslip, Johnny Sexton and Rob Kearney. Rory was pretty much a second captain to Paul O'Connell anyway. He will just get on with the job. There were only a few home-grown coaches England could have gone for, such as Jim Mallinder and Rob Baxter. I think they have chosen the right man in Eddie Jones because he has the experience with Australia and South Africa. He doesn't take it too seriously and can have a bit of a laugh. That's what I like to see in a manager. With Stuart Lancaster, he always looked as if he was fighting to keep his job. It is a difficult start for Wales - some people have tipped them for the Championship. But I am going for Ireland, and we'll take it from there. Joe Schmidt always seems to get a good squad out on the pitch and they work hard for him. As for the Six Nations itself, I expect the three most consistent teams over the last few years will be contesting the Six Nations - Ireland, England and Wales.